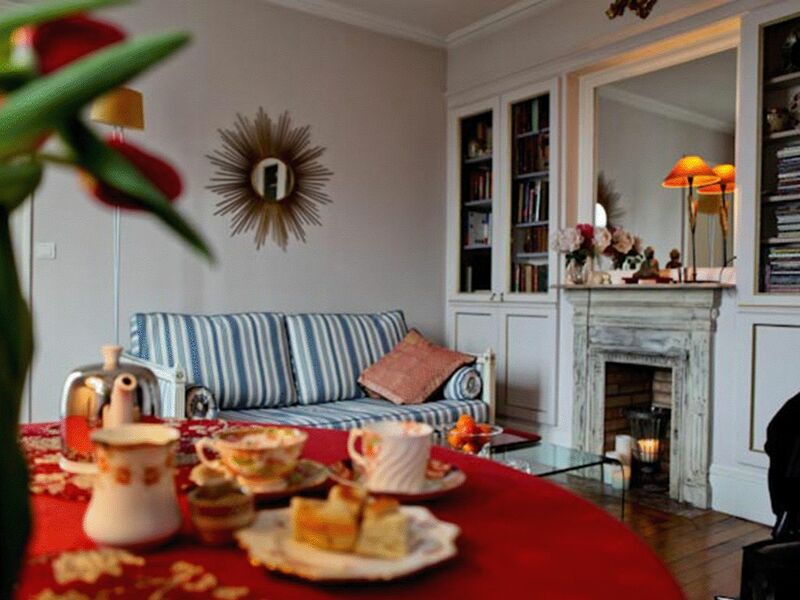 Elegant quiet and private, with view over gardens to Sacré Coeur, etc. This particular patch of the Latin Quarter is a slice of foodie heaven. Oh yes, and Paris landmarks too - Notre Dame, the Pantheon, Luxembourg Gardens, Jardin des Plates, the Sorbonne, the Seine, Boulevard St. Germain, etc. are all just a short, interesting walk away . And yet, the apartment itself, being situated in a courtyard/garden behind the street building , is peaceful and airy with views of trees and gardens and various landmarks, including Sacré Coeur up in Montmartre and close by, Notre Dame. Although when the trees have their leaves N.D is mostly hidden these days. It is on the top floor of a 4 floor walk up (it`s a typical old Latin Quarter building) but as soon as you walk through the door you are in your own Paris world. No t.v.s or feet pounding over your head at midnight! And when you head out, you will find yourself in the beating heart of old Paris. Better still, we have 5 ot do bus routes with stops close by, that take you all over Paris - for example - the #86 winds through tiny left bank streets ( you could almost touch the lovely shops sometimes) and 20 minutes or so later you have stopped right under the Eiffel Tower. And at the other end of the street there is the #67 which crosses the Seine and winds up through various neighborhoods to Montmartre (about 40 minutes) So much cheaper and more fun than a tour bus! If you get a weekly pass you can get off in an area you would like to explore and then get back on again later. Such a nice way to get to know Paris. There is supermarket across the street , open until 10pm every night (except Sunday). And of in addition to the bakeries there are lovely food shops to drool over everywhere you turn. That`s when you appreciate the stairs!! There`s a very friendly cafe on the corner, Le Petit Cardinale, where you can pop in for whatever you fancy from 8am until midnight daily. Or just sit outside and people watch for hours. It has one bedroom, but it sleeps 3 comfortably. In the bathroom the shower is attached to the wall above the bathtub. There is also a bidet. The kitchen is small but well equipped, and there is a microwave/convection combo oven and a 3 ring gas stove top. Also a dishwasher, a washing machine and a dryer, iron and ironing board, hairdryer, etc. I have tons of books, including guidebooks, an eclectic selection of CDs. and an apple laptop with wifi connection. Oh, and TV with CNN,BBC news, etc. Finding a place to rent in Paris can be daunting as there is SO much choice online these days, some of it a little misleading, so you do need to be wary, and if you have any questions it is wise to pick up the phone and call the owner. This may be a special trip for you, an anniversary perhaps , and you want to be sure you find somewhere to stay that lives up to your expectations and will enhance your Paris experience so you will have memories for a lifetime. In this case, this IS my home , and I have set it up accordingly, so it has the comforts and atmosphere of a real home, not a rental unit. I come over from San Francisco for 4/5 months a year and bring whatever creature comforts I find lacking in Paris! If you think my apartment might be a good fit for you, just e.mail me with any and all questions, and feel free to call me too. (415) 533 8871.